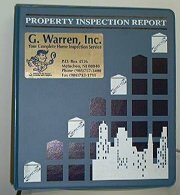 The report is one of the most thorough, detailed, professional reports ever designed for home inspections. Many companies use a checklist type inspection and take the checklist back to their office to generate a computer report that is more boilerplate than information. I might add, this take 3 to 4 days. Most times the buyers' contract gives them only 10 days to get the property inspected. Our report is easy to read with a detailed summary of the noted repairs. To view a sample NJ Home Inspection Report with pictures click here.